DJ C Powers right at home in the studio. Makeup by Raine Raine. Whether he’s in the sound booth at a House of Gunt show, welcoming out-of-town DJs at monthly MIX parties, or creating mixes on Soundcloud, C Powers has had a deep impact on Savannah music culture since arriving in Chatham County eight years ago. 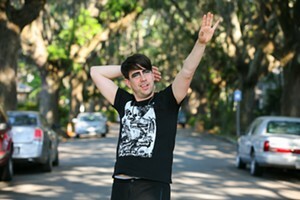 The first-time Best Local DJ winner has become the analog fuel for some of Savannah’s best parties and drag shows, pulling tracks from a massive collection he’s been developing since middle school. 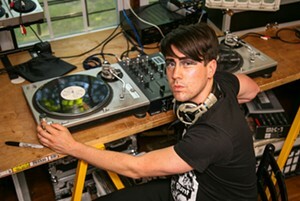 Powers was introduced to electronic music at a very early age while growing up in Atlanta. Powers scraped together weeks of allowance money to purchase his first set of turntables. His Deadhead parents supported the endeavor, taking the 11-year-old to Little Five Points record shops for digging. Over the years, Powers lived in the record-hunting goldmines of Chicago and London. Powers arrived in Savannah in 2010 site unseen when his wife, Michelle Quick, accepted a position at SCAD. He began collaborating with Safe//Sound, the events and promotion entity created by Gus Muller and Jae Matthews of Boy Harsher. Together, the trio stared booking electronic and post-punk shows, and Powers began DJing at DIY events. Those house parties paved the way for Cape Fear, a recurring event at Hang Fire where DJs spun in a room with blacked-out windows. 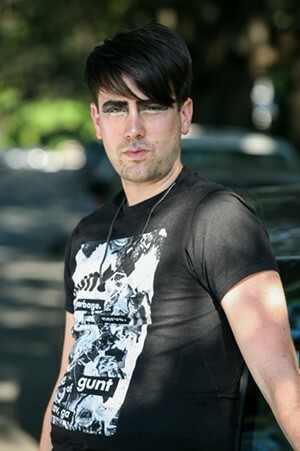 Around that time, Powers was approached by House of Gunt co-founder Monster C*nt, who was searching for a new DJ. Soon, Powers was helping the collective with audio and working with them for hours in the studio, creating new tracks. Drag and dance music culture are inherently entwined, but Powers finds that the work resonates even louder in a smaller Southern town like Savannah. In the last year, Powers teamed up with friends Raine Raine and Greg Hornak to create MIX, a monthly party in the basement of Club One. The event, bathed in Hornak’s projected visuals, is an opportunity to bring in touring DJs and electronic music talent and add in performance and drag. It’s a free show, and no MIX is exactly alike. You can read all about this week’s MIX in this issue, and mark your calendar for June 2 for “Brood,” a new House of Gunt show with an insect theme, DJ’d by Powers. Powers may be taking some weekends to perform out of town, but he enjoys coming home to Savannah.